Cleveland is a true melting pot of European immigrants. In the early part of the 1900’s, Cleveland’s population grew and grew from those that came through Ellis Island. There is a heavy influence of Eastern Europe with neighborhoods filled with those with descendants from Poland, Ukraine, Hungary and many others. Many came from Austria and Germany, and there still is a “little Italy” in the city. Even with all of those other countries, the city grinds to a halt one day of the year, St. Patrick’s Day! Some schools close so the kids can go to the parade. Now you may think of other cities that have parades (New York, Boston, etc..) but while those cities will often move the parade to another date, Cleveland never waivers and holds it on the day of green. The bars open (and are filled) at 6AM, and by the time the parade kicks off, many viewers are nice and jolly. 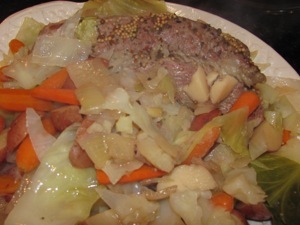 Whether you have to work that day, or get to go to the parade, you come home hungry for a nice Irish meal. 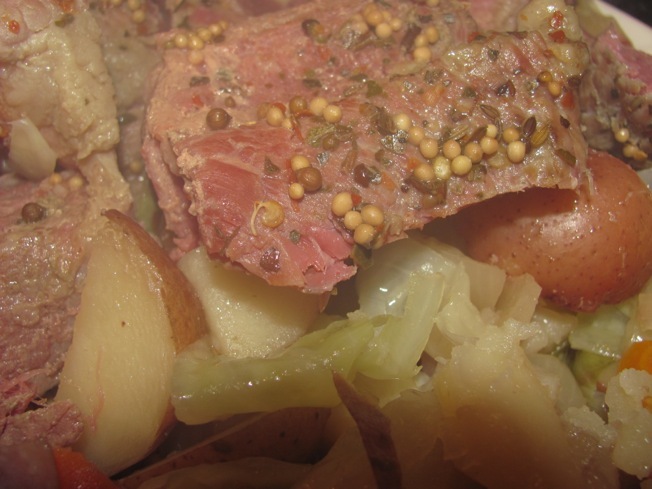 The best way to make that happen is with the slow cooker. 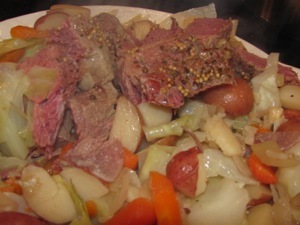 Corned Beef and cabbage, with very little effort! 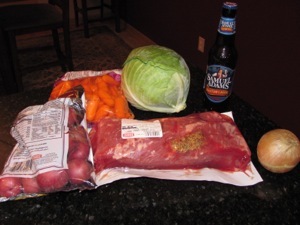 I didn’t have any Guinness but will for St. Paddy’s Day! 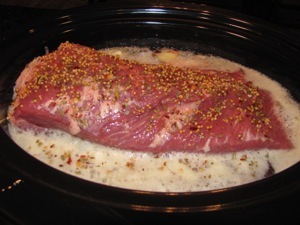 The beef sitting in the slow cooker. It comes out so tender. >and by the time the parade kicks off, many viewers are nice and jolly.